Started in 1954 by our grandfather, Alfred Kahle, our company has been in our family for three generations and is still going strong. Since our beginning, we have followed the motto of “quality comes first” because we always want to be proud of what we have built or created. 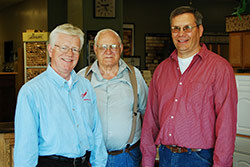 Our father, Richard Kahle, took over the business in the early 1970s. He helped expand our services to include remodeling, condominium construction, and custom home design and building. In 1999, Dave, Bruce, and Kevin Kahle took over the company, and further expanded the business to large custom homes, land developments, additional remodeling services, and condos. We have continued the work of our father and grandfather to establish Kahle Design & Build as one of the finest home builders in the area. We are proud to be part of a company that is over 60 years old, and has the reputation for being the team you can trust. Our commitment to providing you and your family with high quality renovation, construction, and homebuilding solutions starts with our family. For every job, our team — our family — is put to work for you. Dave does all of the rough frame layout, project running, and design work. Bruce runs projects and specializes in finish carpentry, and brings true quality to all of his work. Finally, Kevin specializes in kitchens and custom mill work. We have all been in the family business since we were big enough to assist on job sites, doing every thing from digging footers to countersinking the last finish nail. For more information about our services, please give us a call today at 419-782-7749 or fill out our contact form. We are ready to help your build or remodel the home of your dreams!